Statistics Canada has no CEAP projects to report on for 20112012. Figure 2 shows the seven-year trend of Statistics Canada's total spending and spending net of respendable revenue. Note: Total spending includes respendable cost-recovery revenues. Net spending is equivalent to total corporate expenditures less expenditures related to cost-recovery programs. As Figure 2 shows, total and net spending rose in 20102011, peaked in 20112012 when the 2011 Census of Population, NHS and 2011 Census of Agriculture were conducted, and are projected to drop sharply in 20122013 as these activities begin to wind down. This cyclical pattern is typical for the Agency. 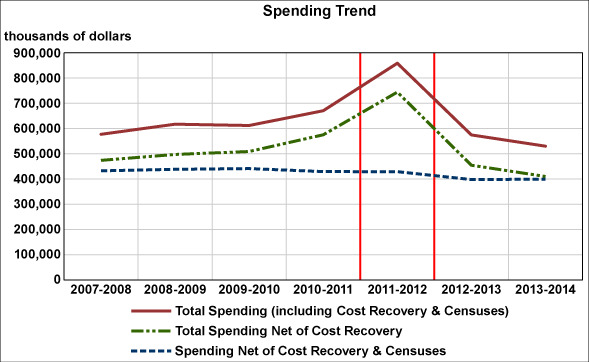 Figure 2 also shows that spending, net of cost recovery, the censuses and the NHS remains relatively stable over the seven-year cycle. Funding for regular economic increases for wages, and new spending on initiatives such as the Canadian Environmental Sustainability Indicators, the Harmonized Sales Tax Secretariat and the Consumer Price Index, have been offset by spending cuts, including the cuts resulting from the strategic review process in 2007, procurement savings, and other cost-containment measures. The decrease in spending projected for 20122013 net of cost recovery and of census is mainly due to the transfer of email, data centres, network services and telecommunication to Shared Services Canada. For information on Statistics Canada's organizational Votes and/or statutory expenditures, please see the Public Accounts of Canada 2012 (Volume 2). An electronic version of the Public Accounts 2012 is available on the Public Works and Government Services Canada's website.